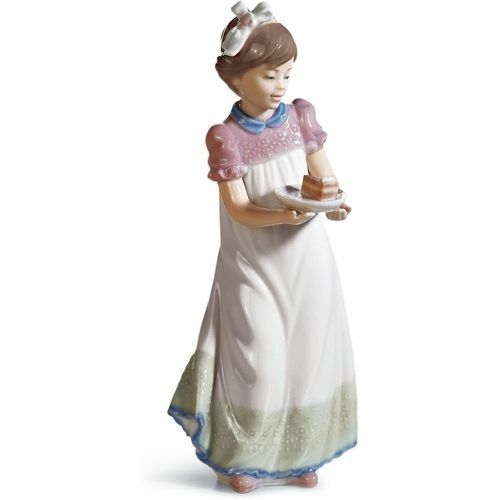 This beautiful porcelain figurine depicts a sweet young girl holding a slice of birthday cake. Dressed in beautiful pink, white and green dress, the gentle and affectionate expression of elation on her face is highlighted by the pastel hues of the fine porcelain. An intricate floral motif decorates her dress and a blue trim around the hem and collar gives a lifelike quality to the girl. Ideal as a gift or keepsake for birthdays to commemorate that special day. Lladro Porcelain is produced by Artisans in Valencia in Spain. Lladro is made for memories, these beautiful classic and timeless creations make the perfect gift for all those special occasions throughout the years and make wonderful keepsakes for family & friends to treasure. Each piece is lovingly handmade and hand painted & comes with their unique Lladro markings by the Valencia Artisans. The Lladro Happy Birthday comes presented in its Lladro presentation box & a certificate of authentication.